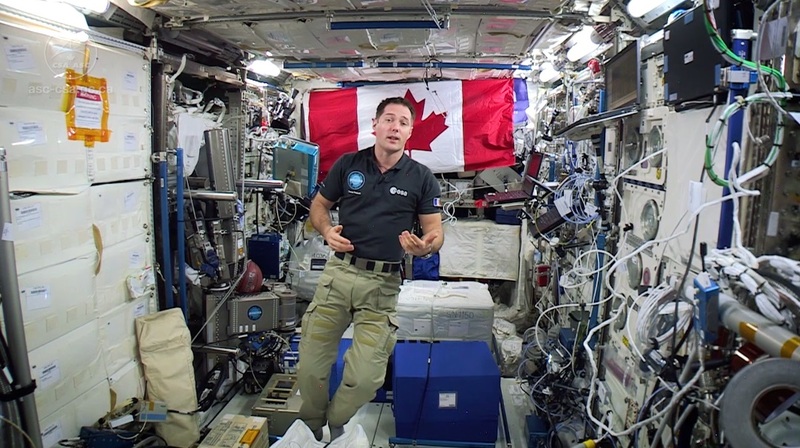 At Home in Space is Canada’s first psychosocial experiment on board the International Space Station (ISS). It examines how astronauts from all over the world make the Station feel like home, far from friends and family, in an often stressful space environment. Astronauts spend years training for their missions, but no amount of groundwork can truly prepare them for the unique, spontaneous adaptations they must make when living in space. They are faced with isolation, loneliness, high stress levels, and cramped quarters with new roommates. At Home in Space takes a closer look at how crewmembers adapt to living with each other by creating a shared culture. Its findings could help develop guidelines to enhance the well-being of space travellers during longer trips to faraway destinations like Mars. The findings of this study could be applied to people living in remote environments. Expeditions to polar regions, military deployments, voyages on cargo ships, and jobs on oil rigs are extreme experiences that feature small quarters and having little contact with family for long periods of time. A greater understanding of cooperative living could also help nursing homes learn how to ease a new resident’s transition into a shared space. They are also encouraged to take pictures of celebrations or any other examples of a “ space culture ” being created and of their customized living quarters. Astronauts in space have Internet access! Laptop computers are available for personal use like email and social media. This helps them stay connected to life on Earth. You can follow your favourite astronaut on social media for updates as they make a home away from home on board the ISS. At Home in Space began in 2015 and is expected to be completed in 2019/2020.